Acceptance and Commitment Therapy (ACT) has been advanced as a so-called “third-wave” cognitive-behavioral therapy. It addresses broader aspects of human experience, and identifies and changes the function of behaviors rather than focusing on their form or content. Instead of simply attempting to get rid of dysfunctional thoughts, these therapies aim at moving toward acceptance of the thoughts and feelings and realigning the patient’s behaviors toward valued life goals. Some have added a focus on mindfulness (therapies in this “third-wave” group include dialectical behavior therapy [DBT], cognitive behavioral analysis system of psychotherapy [CBASP)], functional analytic psychotherapy [FAP], and integrative behavioral couple therapy [IBCT]). All of these have been attempting to gain admission to the hallowed halls of evidence-supported therapies, with mixed success thus far (for assessments and criteria, see Powers MB et al. Acceptance and commitment therapy: a meta-analytic review. Psychother Psychosom 2009; 78(2):73-80, and Ost LG. Efficacy of the third wave of behavioral therapies: a systematic review and meta-analysis. Behav Res Ther 2008 Mar; 46(3):296-321). Professor Steven Hayes of the University of Nevada at Reno, one of the major figures in developing ACT as it is now researched and practiced, and his colleagues have been editing a series of books describing research and clinical applications of ACT that are limited to areas in which at least one randomized controlled trial has been conducted. The current volume, written by three psychologists mentored by Dr. Hayes, addresses the interesting application of the ACT model to the broad area of body dissatisfaction and not to eating disorders per se (other publications describe ACT for anorexia nervosa). Some degree of body dissatisfaction as envisioned here is extremely common, and occurs almost as “normative dissatisfaction” among the population at large. It is particularly prevalent among patients seen by mental health and general health professionals, for example, patients with diabetes and obesity, disfigurements related to injuries and mutilating surgeries, and many other conditions. This volume offers a nice opportunity for those unfamiliar with ACT to learn its basic premises and rationales and to see how specific tactics and exercises are applied to body dissatisfaction. I knew little about ACT prior to reading this book, and thus have appreciated the opportunity to make its acquaintance and to see its possibilities in this application. To start, three theoretical bases of ACT are presented: relational frame theory, cognitive fusion, and experiential avoidance. Briefly (and I’m obviously oversimplifying many complex concepts here), words carry psychological power and in some instances can be harmful to us. At early ages, we form our identities and sense of self, for good and bad, by buying into and becoming attached to various cognitive schemes—some of which are dysfunctional. And, we develop a host of ways of avoiding unwanted thoughts and experiences. In the treatment, the six core processes comprising ACT address these issues, subsumed under two overarching themes: Mindfulness and Acceptance (which focuses on “self-as-context,” contact with the present moment, defusion, and acceptance), and Behavior Change and Committed Action (which focuses on self-as-context, contact with the present moment, values, and committed action). As is evident, these processes resemble some Buddhist practices, including facing and delving into the connections between one’s psychic pain and the thoughts that generate them. This also involves accepting and examining these thoughts and their origins, then deconstructing them, releasing the dysfunctional thoughts, and then, via “creative hopelessness” (after it’s clear that prior efforts at ineffective control don’t work) increasing future cognitive flexibility devoted to satisfying deeper values and goals. 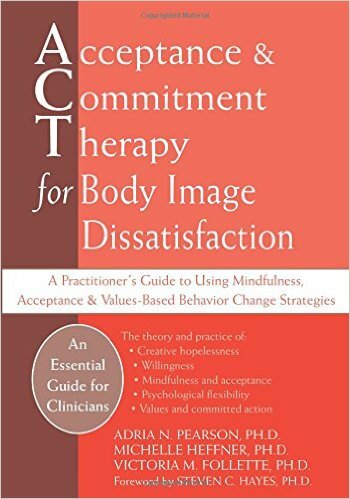 With respect to treating body dissatisfaction per se, the book provides numerous case illustrations and practical applications that offer very specific instruments for assessing weight and body dissatisfaction and experiential avoidance and for using the results of these assessments in furthering the six core processes. Questions for discussion and consideration are attached to many of the cases. Detailed suggestions are offered for dealing with barriers and resistances, and for focusing on “workability.” I particularly like the numerous, rich, concrete exercises using imaginal techniques and the helpful worksheets. As a final bonus, the authors describe how these techniques might apply in a group and workshop format, and offer several exercises particularly suited to these applications.